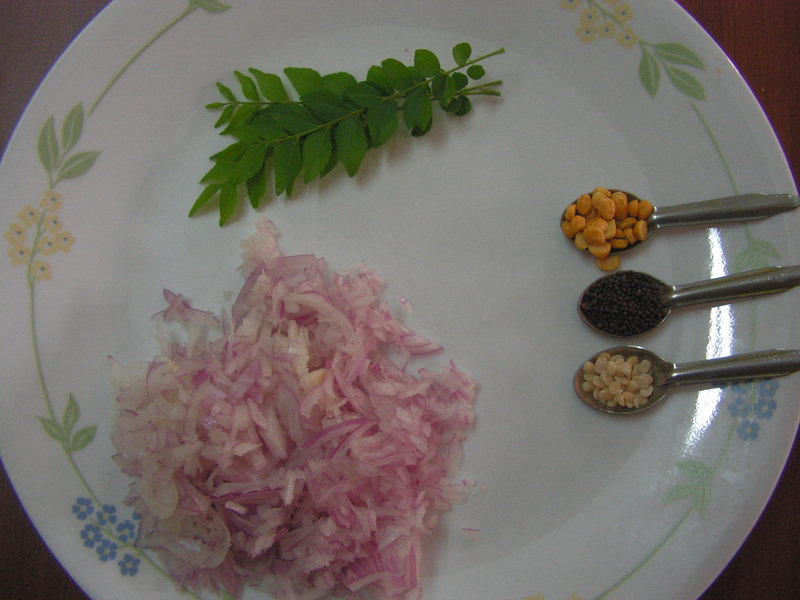 Toor dal/ split pigeon peas/Thogaribele/Thoridali in english, kannada and konkani respectively. 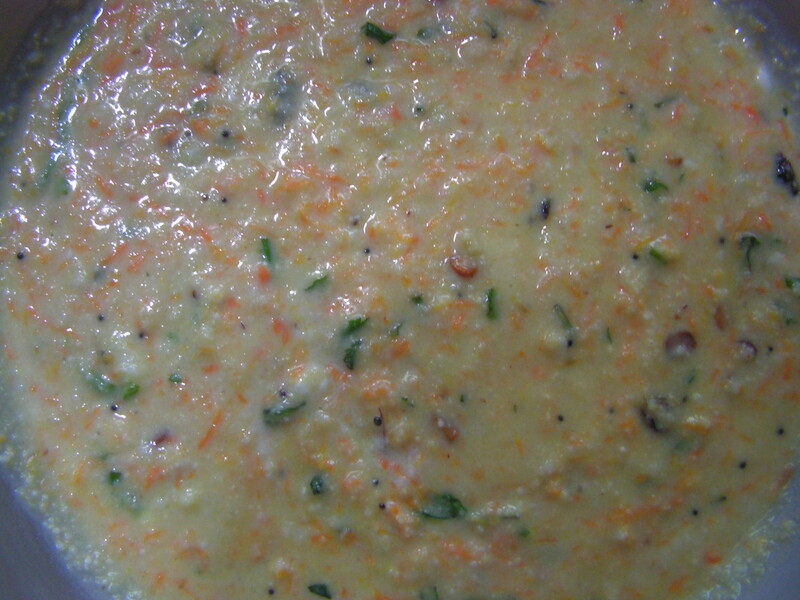 Toor dal is the main ingredient used for multiple dishes in the indian kitchen. For daily menu for lunch/dinner it is a must. I have already put up “Dal fry” and “Dalithoy” and many other dishes but these are the two signature dishes which are very well accepted by my viewers. A variety of idlis also are there and today i would like to put up “Toor dal idli” to add to the long list of idli on this blog. This is my version of the recipe. 1. 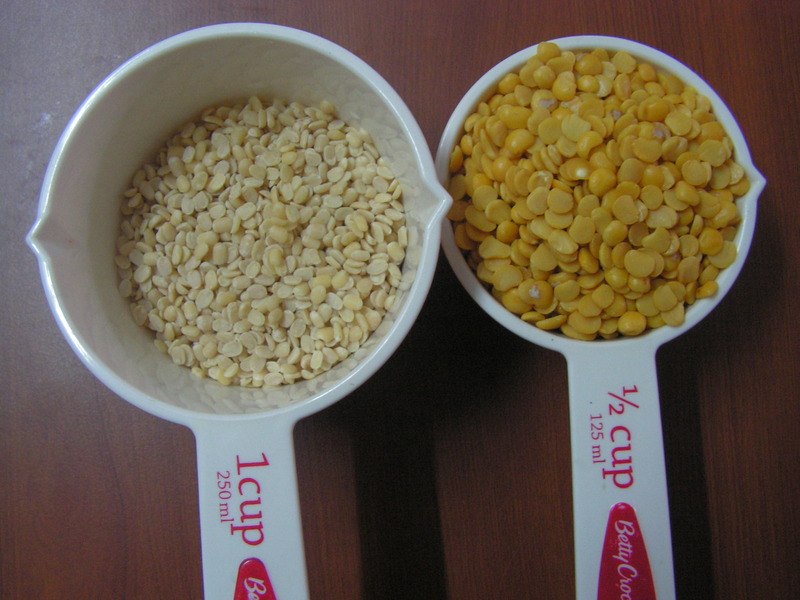 Soak both toor dal and black gram dal in water in two separate bowls for about 4 hours. 2. Grind black gram dal in the grinder/ mixer adding water in steps to a very fine and thick consistency. 3. 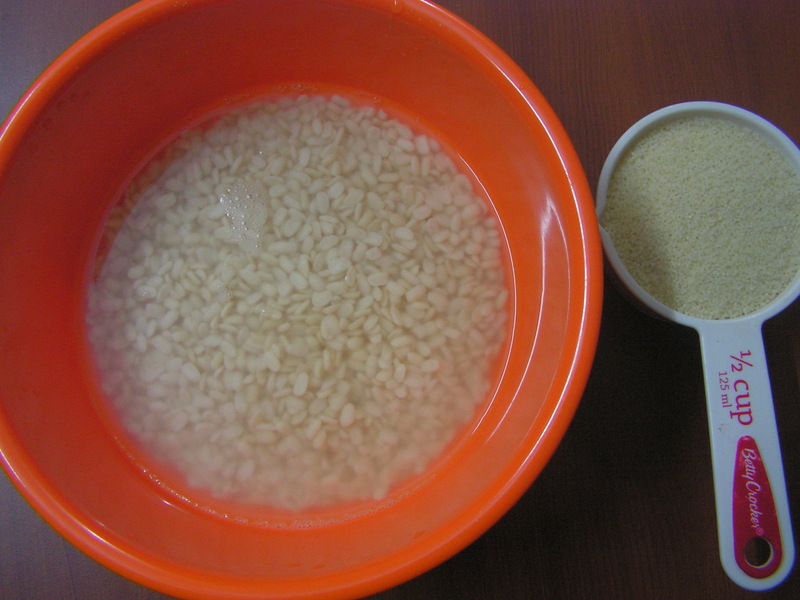 Transfer it to a wide bowl giving room for fermentation and add rice sujee and salt to it allow it to ferment over night. 5. 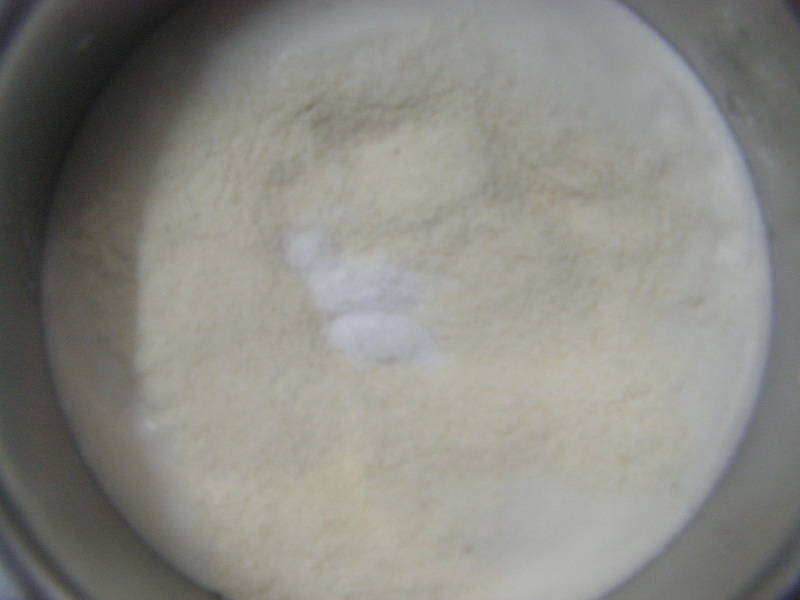 Greece idli mould and pour the dough into each mould . 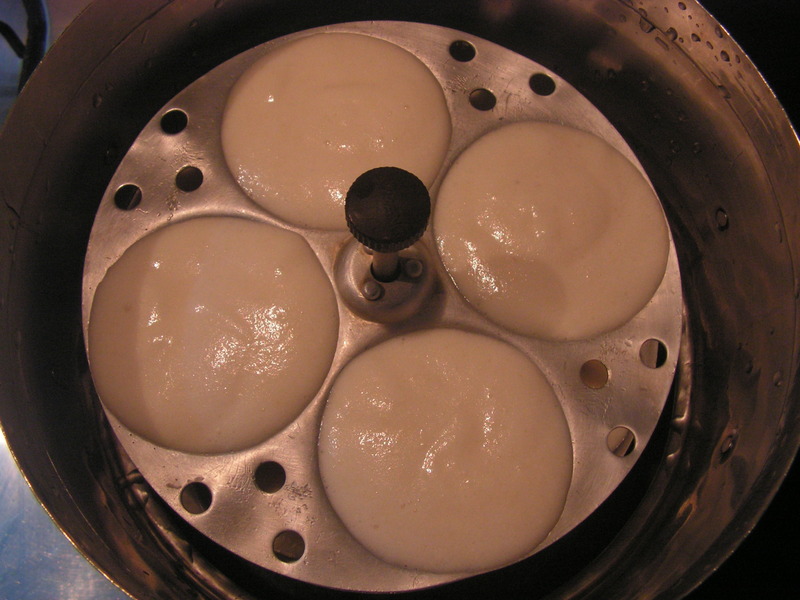 Place a wide idli steamer with enough water in it on medium flame. When it starts boiling place the idli stand in it and cook for about 25 minutes. 6. Transfer it to serving plate and enjoy with any chutney of your choice. Yummmmm!!!!!!!!!!!! Note: 1. 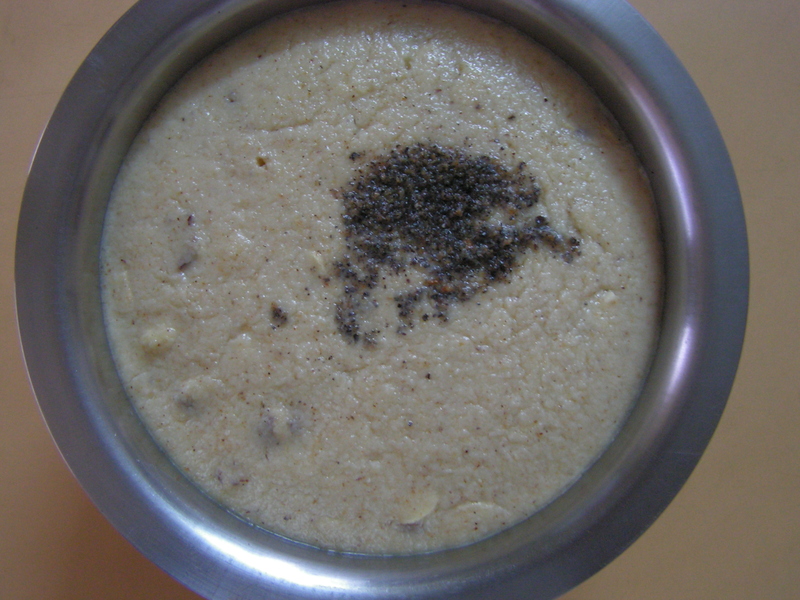 Black gram dal should be of a good quality for idli to turn out soft. 2. Grinding toor dal at night is for convenience. One can even soak it in the morning and grind at once and add it to the fermented dough. The reason for not adding toor dal at night is it gives a very bad odour. 3. 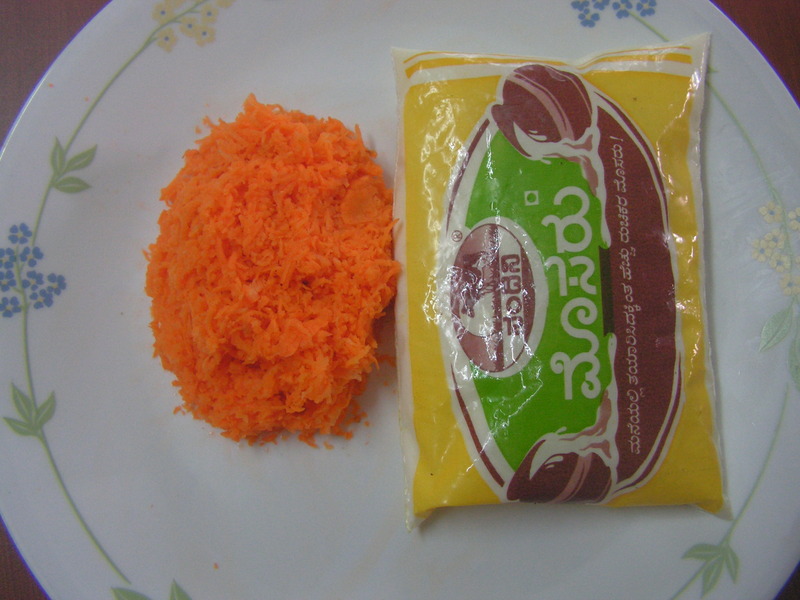 I prepare rice rava at home using Sona masoorie raw rice. 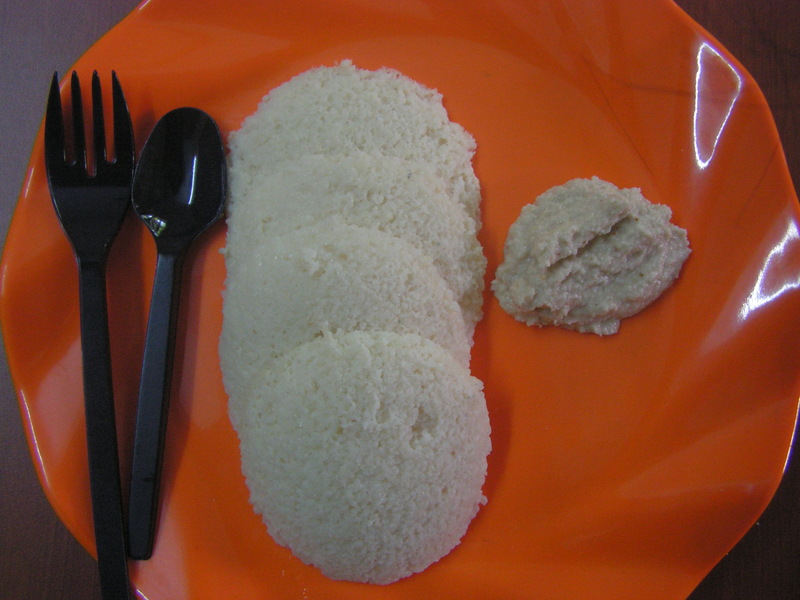 This entry was posted in Uncategorized and tagged Idli point, Idlis. 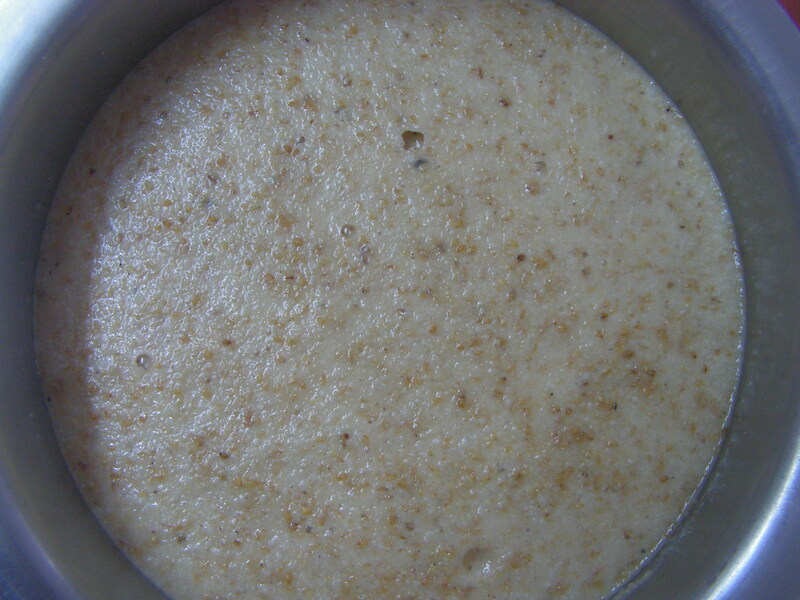 Foxtail millet/Navane is cooked like rice in the regions of Telengana. A generation back this was the common food of the region and now is making a come back as it is more healthier than rice.One can pressure cook like rice and consume it with dal and a small quantity is very filling. It is non allergic and is good for every one especially for diabetics and babies too as it is easily digestible . This has a nutty flavour and is more beneficial than in consuming than the risk involved. 1. Soak blackgram dal in water for about 3 hours. Also wash and soak foxtail millet in water for about 1/2 an hour. Drain and dry on a dry cotton cloth. 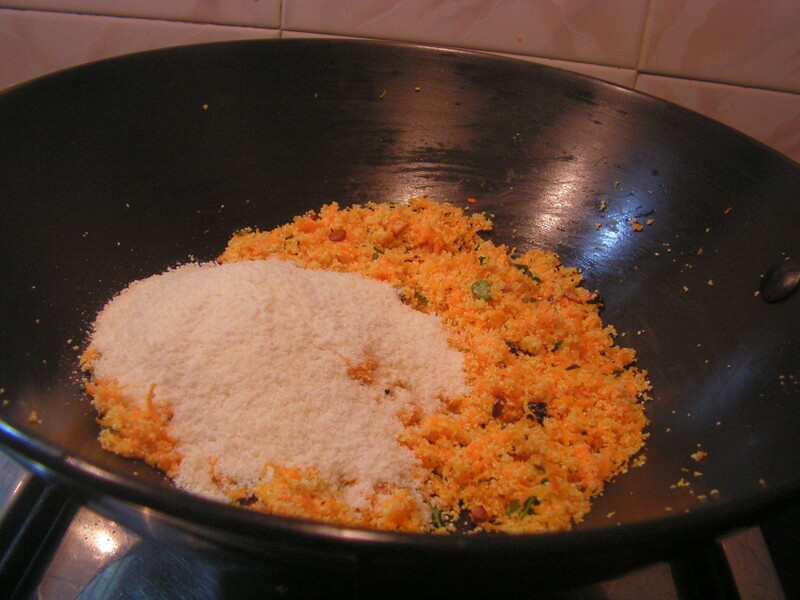 Grind it into coarse sujee in the mixer and keep it aside as shown in image-1. 2. 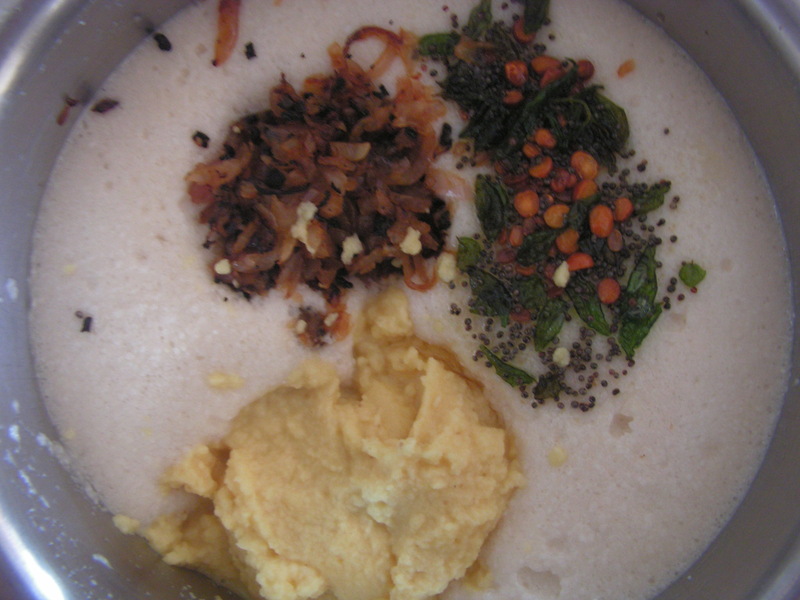 Grind blackgram dal in the mixer/grinder adding water in steps to a fine and thick consistency. 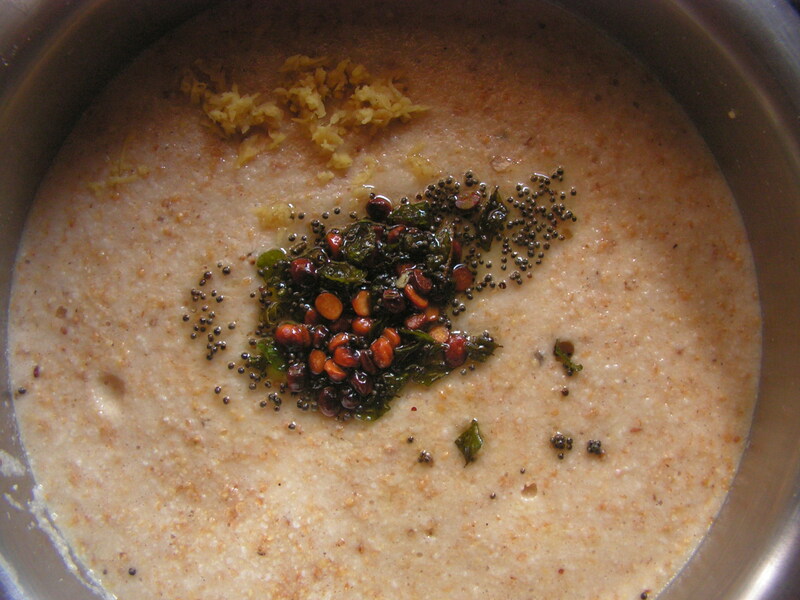 Transfer it to a wide bowl and add rice sujee, salt and also foxtail millet sujee to it. 3. 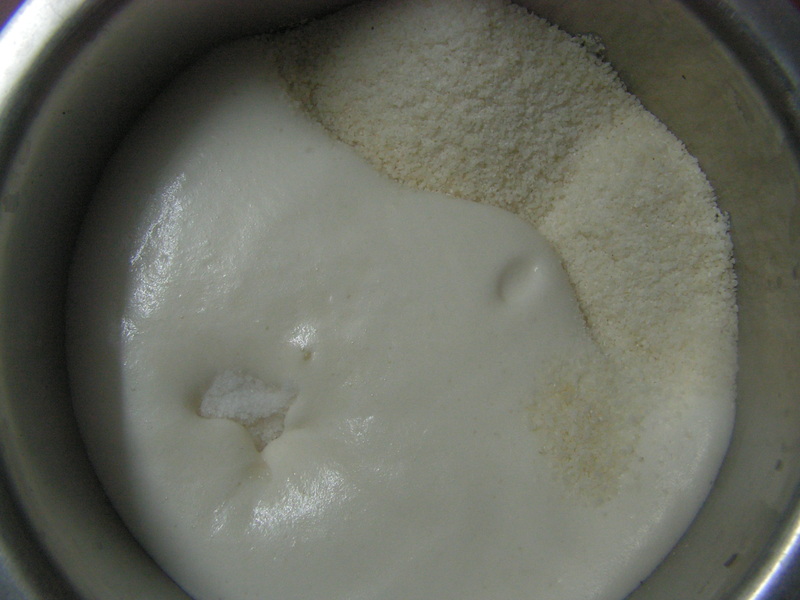 Give a strong stir with your hands and the idli batter is as shown in the image below. 4. 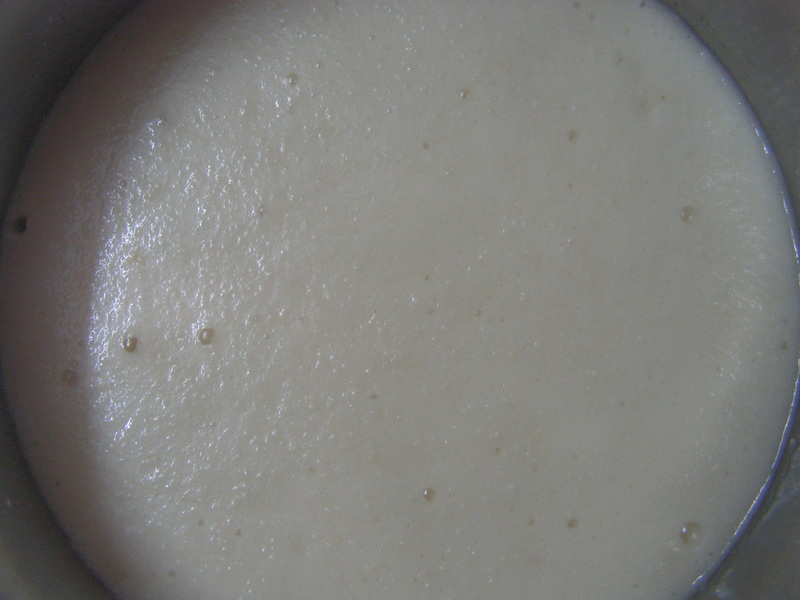 Allow the batter to ferment over night and is as shown in the image below. 5. 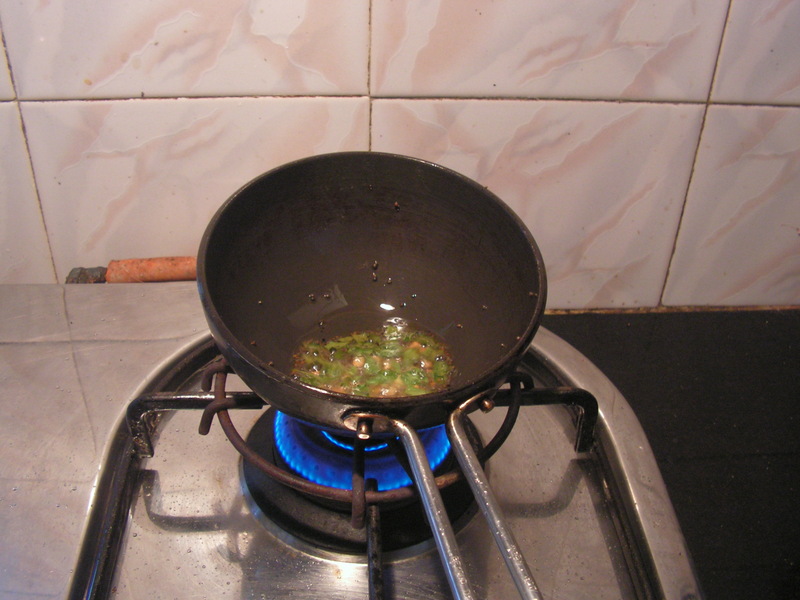 Place a spatula with 1 teaspoon of cooking oil in it on low/medium flame. When heated add mustard seeds to it. When it starts spluttering add benglgram dal to it. 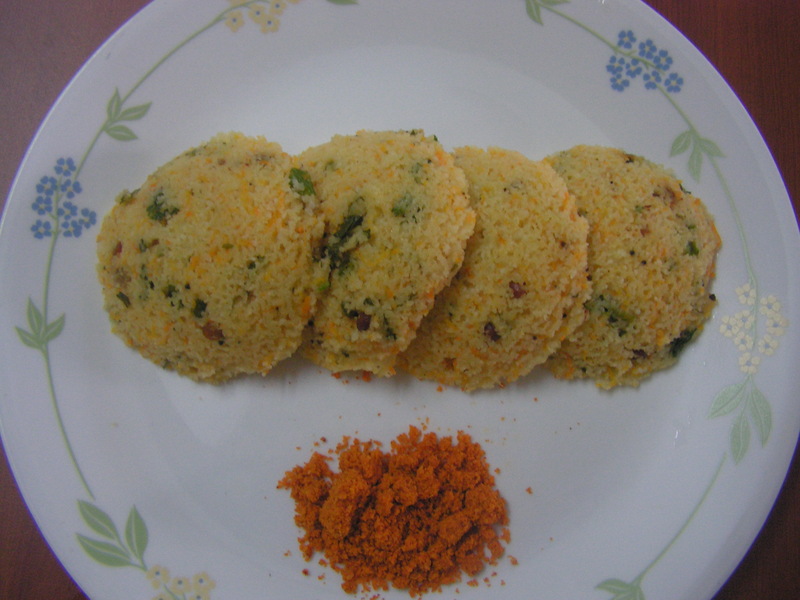 When it is fried add curry laves to it and add this seasoning to the idli batter and also add grated ginger paste to it. 7. 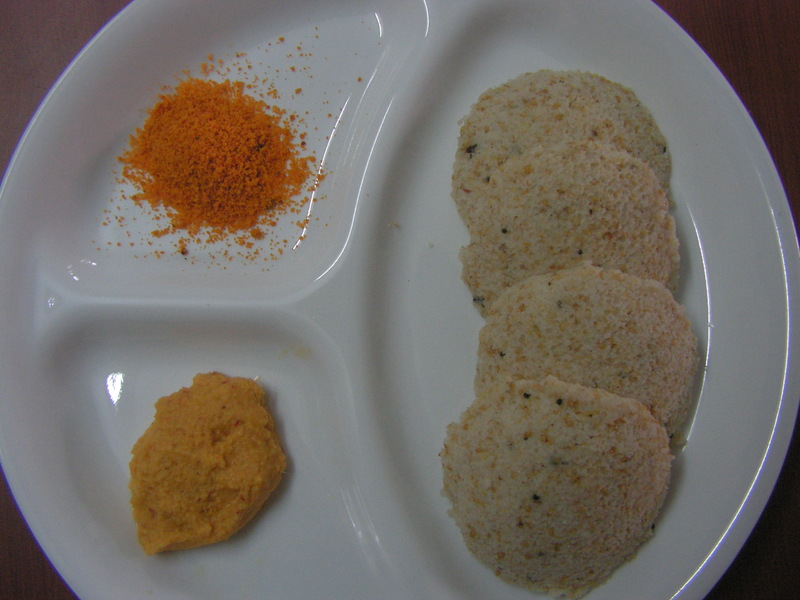 Transfer cooked idli to a serving plate and enjoy with any chutney and chutney powder or sambar of your choice. Yummmmmmmmmmmmmmmmmmm . These idlis are as soft as the normal ones and tasty too!!!! Note: 1. 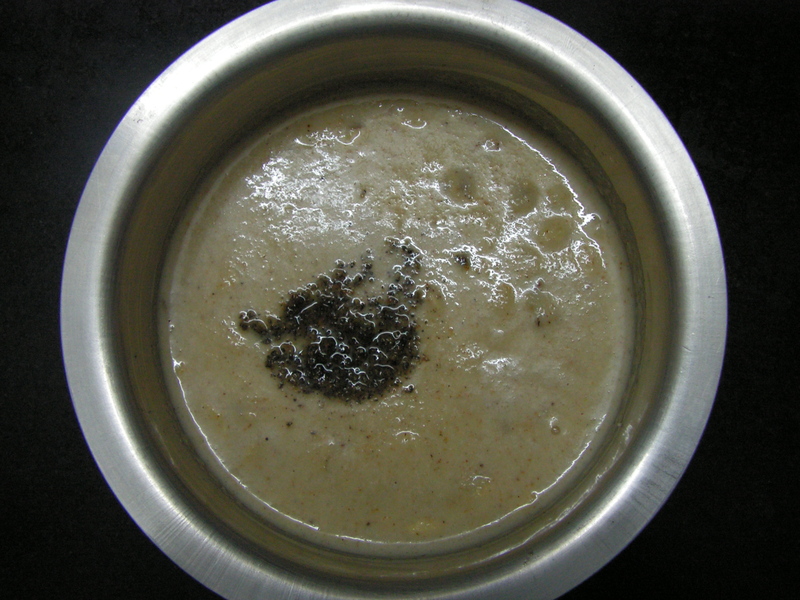 Grind blackgram dal to a thick paste adding water in steps. 2. Buy quality dal for soft and fluffy idli. 3. I make rice sujee also at home with sona masoori rice and push it in the refrigerator to retain the quality as the idli sujee available is not so good. 4. 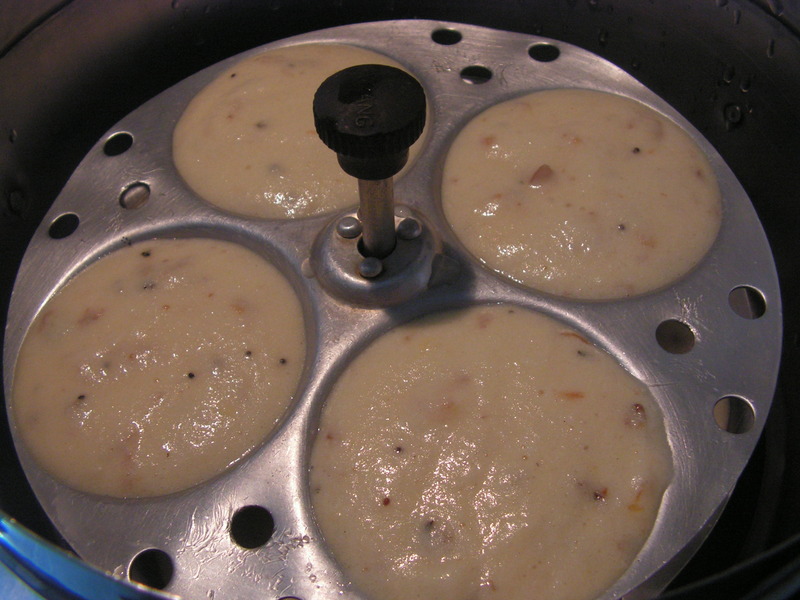 If the batter is not fermented idli will turn hard. 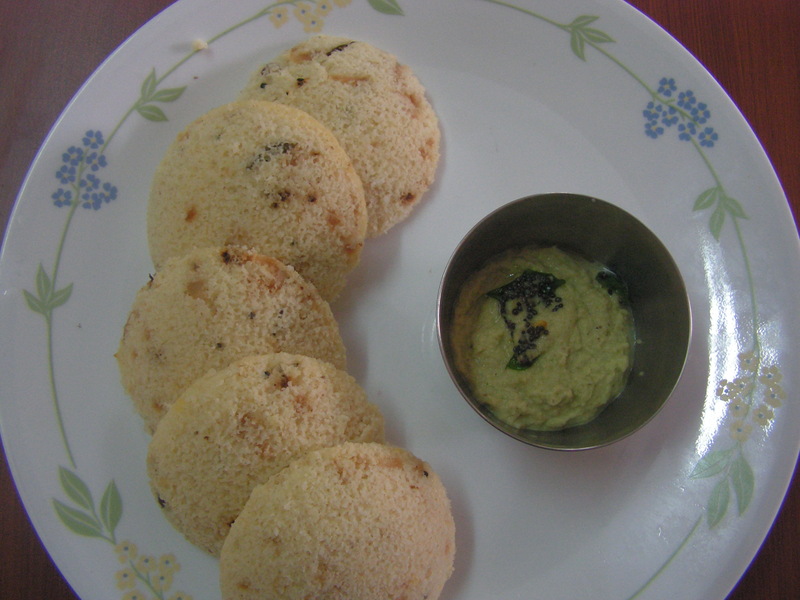 This entry was posted in Uncategorized and tagged Idli point, Idlis, Karnataka dishes. 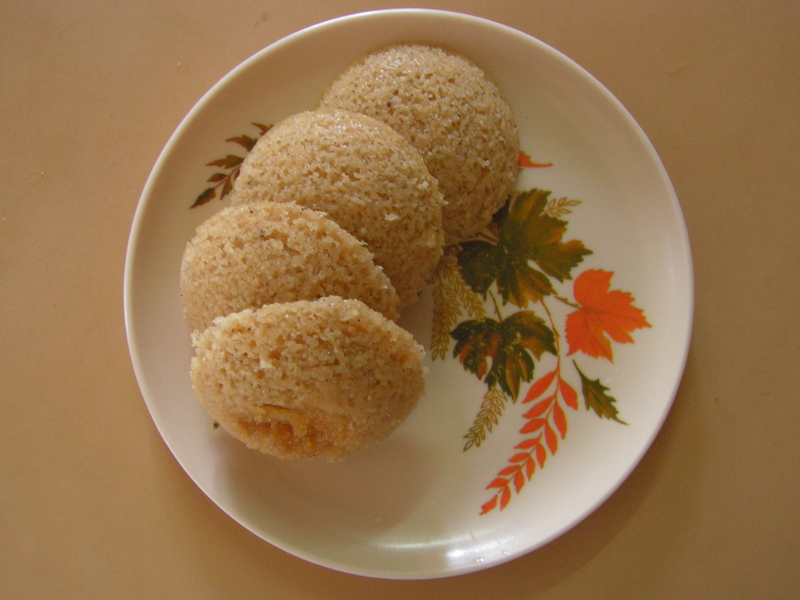 This is a delicacy of the G.S.B families especially from the south canara region. It is prepared whenever we have a lot of coconut at our disposal – coconut that is fresh and not ripe too. It helps the dish turn soft and aromatic too. 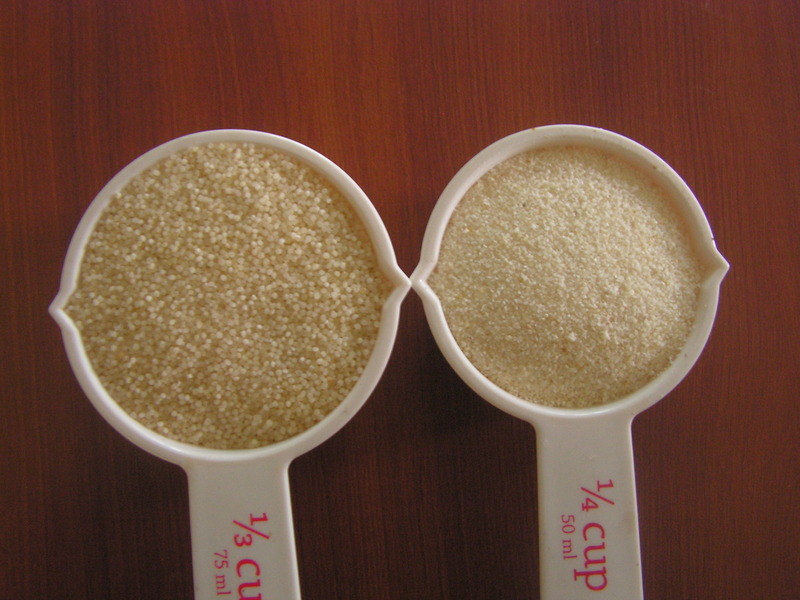 Some people use cooking soda and prepare it without fermenting the dough. 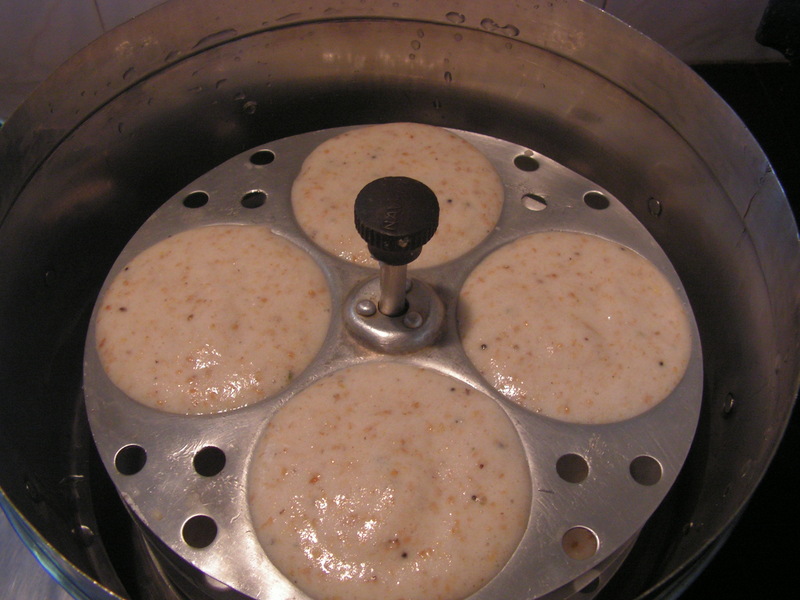 I prefer to ferment the dough naturally so that Idlis are themselves natural without the odor of the soda. Here is my version of the dish. 1. Chop jaggery, grate coconut, chop cashews , peel and powder cardamom and keep it aside. 2. 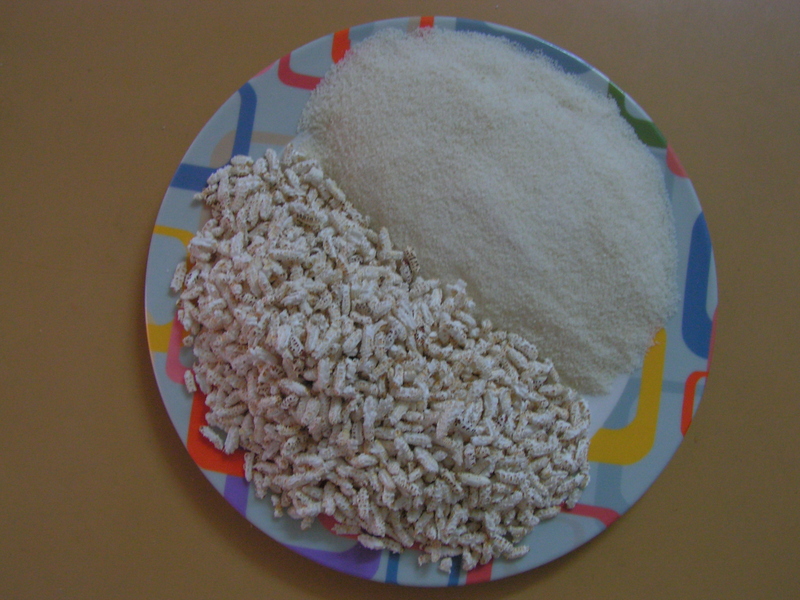 Soak puffed paddy in water for about an hour in 1/2 cup water. It turns completely smooth and ready to grind. Also just dampen rice sujee and keep it aside. 3. 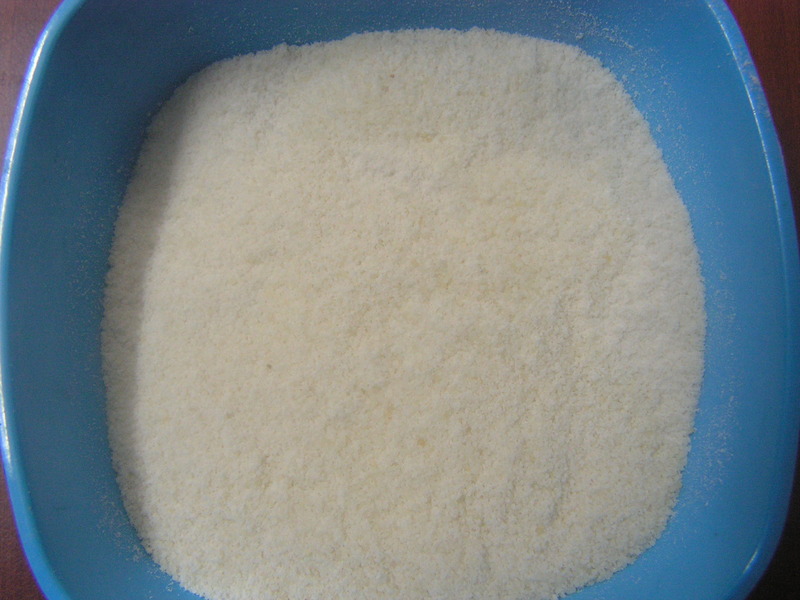 Grind coconut, puffed paddy in the grinder adding water so that it is easy for you to run the mixer to a fine consistency. 4. 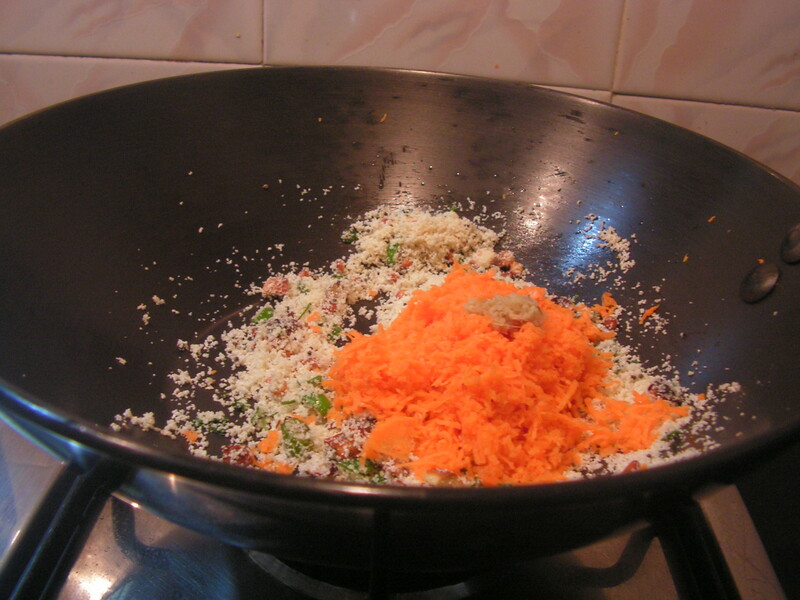 Transfer the grind mix to a bowl and mix drenched rice sujee to it. 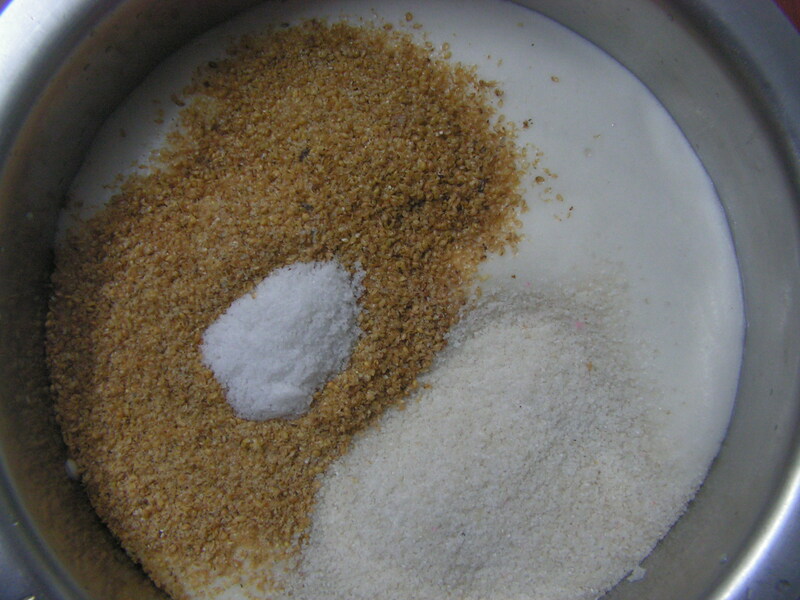 Also add chopped jaggery from step 1 to it and make a dough so that the consistency of the dough is like it is a free fall from a serving spatula adding milk and curds to to it. 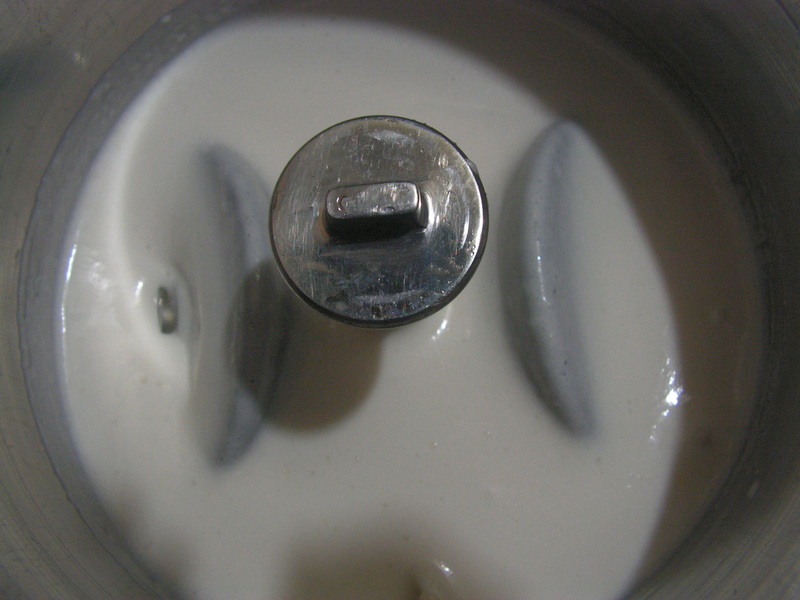 Add cardamom powder and a pinch of salt to it and allow to ferment. 5. 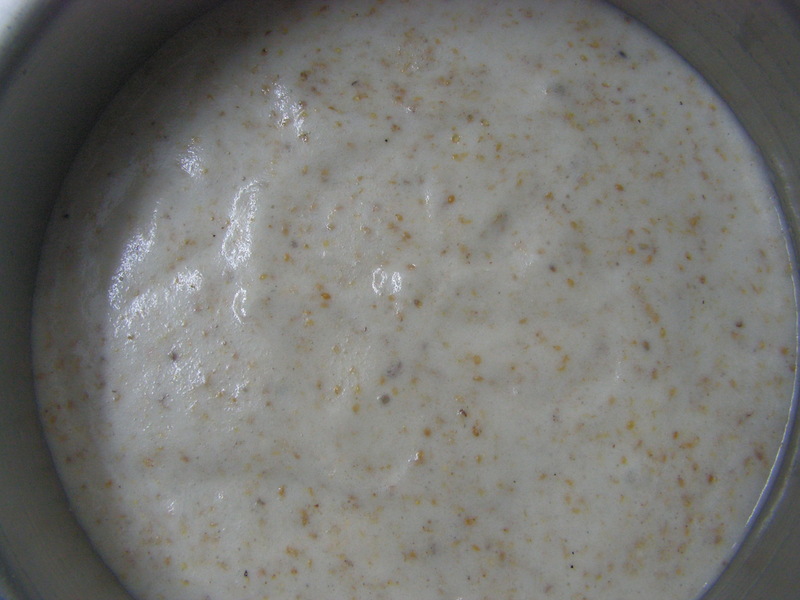 Allow it to ferment for over 12 hours and the dough is as shown in the image below. 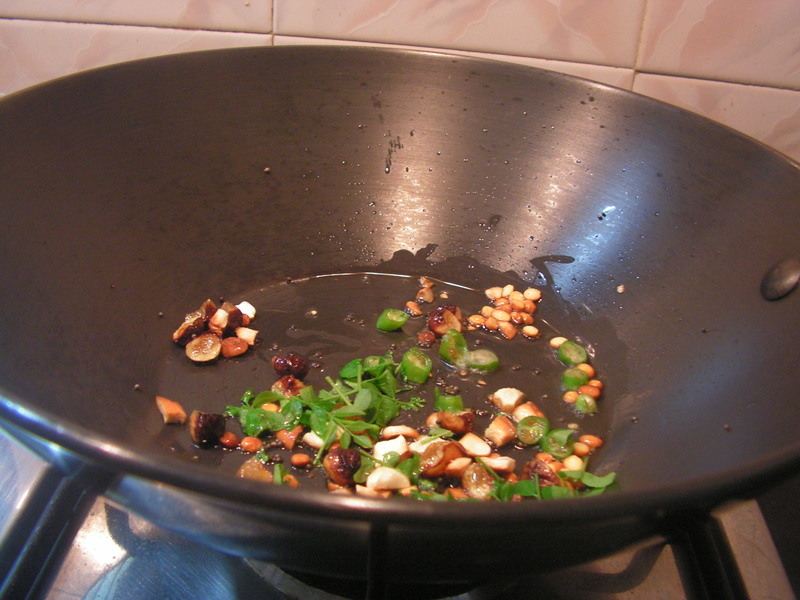 Add dry fruits and give it a strong stir with your hands. 6. 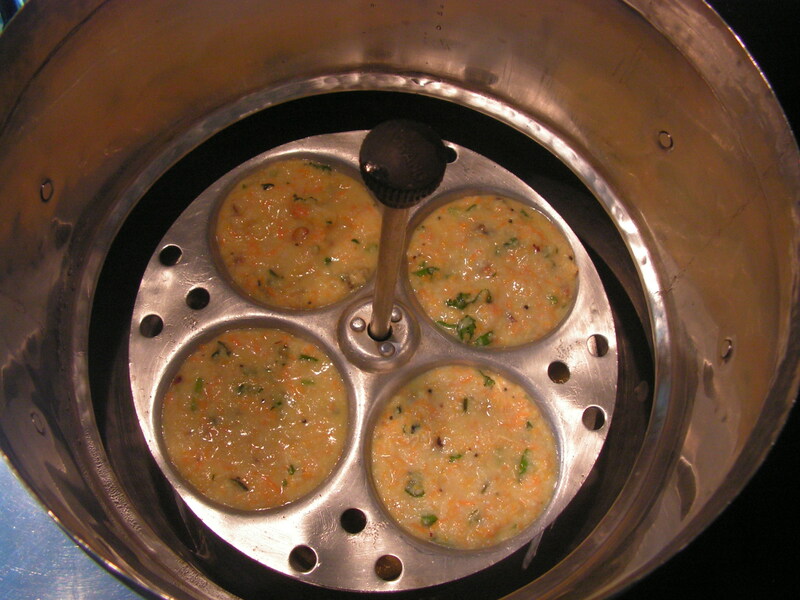 Place a wide idli cooking bowl on the flame with water in it and close it with a lid. 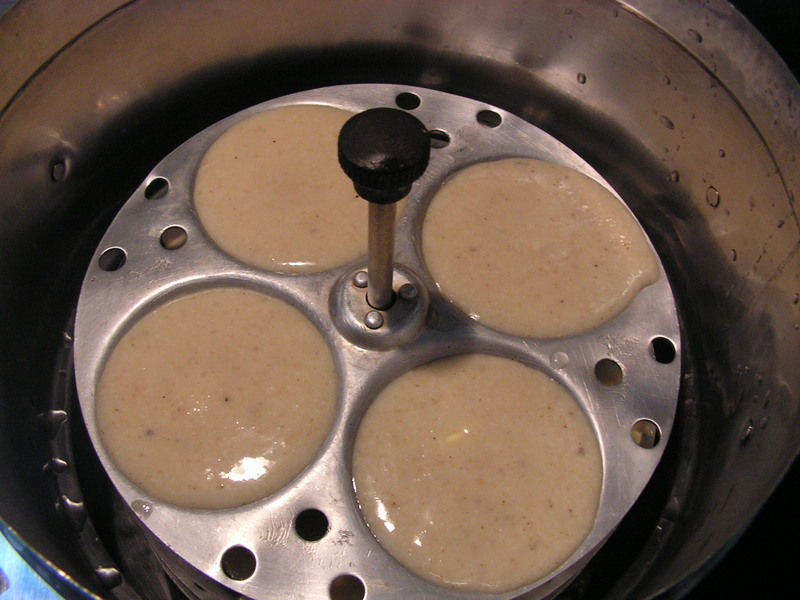 Grease the Idli mould with ghee and pour the dough in each mould and place the idli stand in it and stem it for over 30 minutes. Just prick with the back of a spoon or a knife and if it comes out clean then it is sure to be done. 7. When done transfer it to serving plate and enjoy either plain or with butter. 1. Just wash the store bought rice rava and keep it aside. Since I prepare rice rava at home i just drenched it. 2. Make the dough in such a way that it is a little watery and will be just right on fermentation. 3. 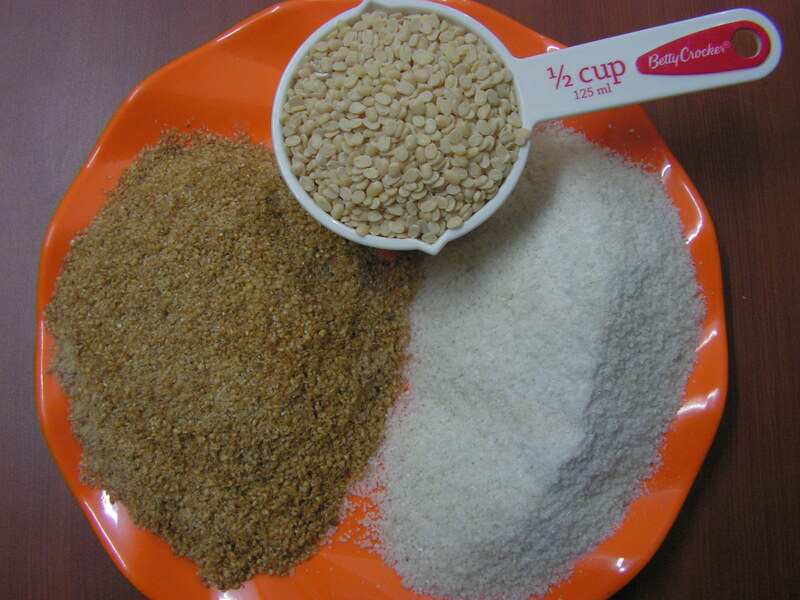 Quantity of jaggery depends upon your own palate. Feel free to add your favorite dry fruits! 4. It takes normally 25-30 minutes to cook since it is sweet and the ingredients like coconut take a long time to cook with jaggery as well. 5. 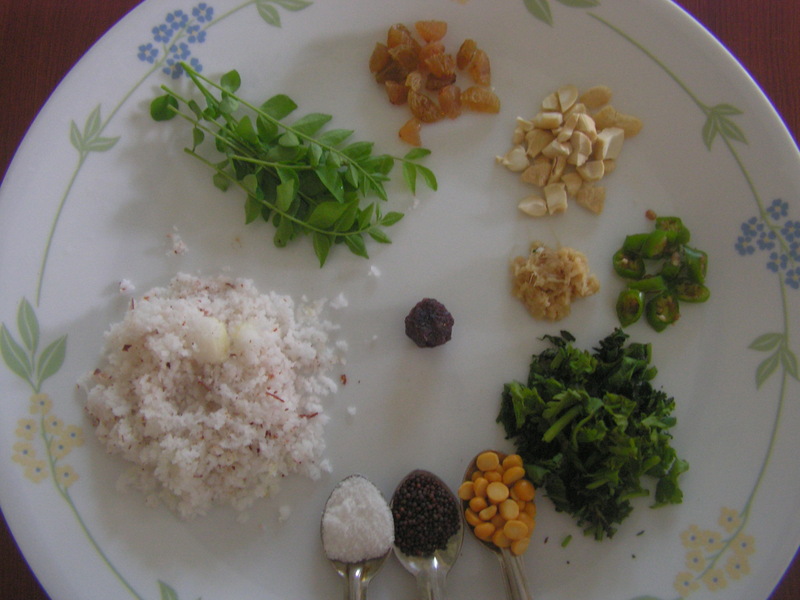 Adding cooking soda and preparing idli without fermenting is one’s choice for sure!!!!!!!!! 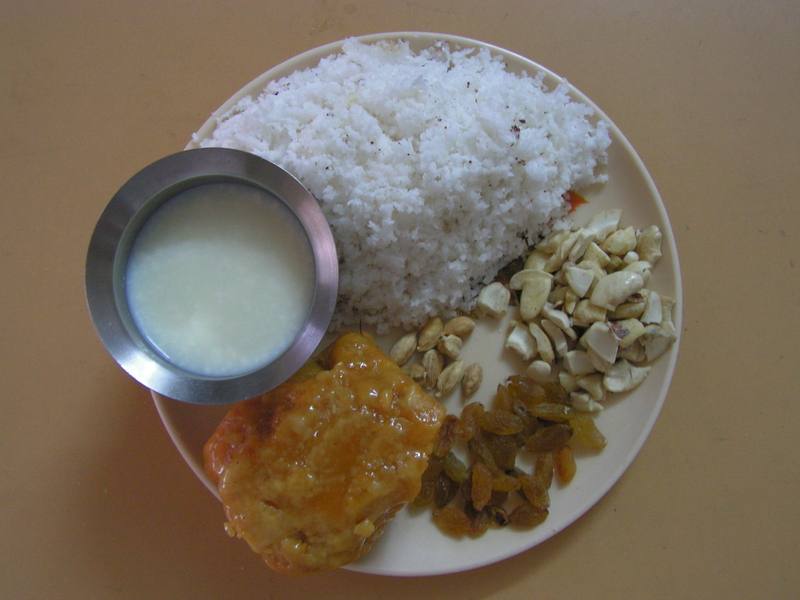 This entry was posted in Uncategorized and tagged Idli point, Konkani dishes, Lunch box, Tiffin.